You can find lots of information online about animal cruelty & reasons for becoming vegan. Your body will thank you - especially if you eat a well balanced diet with as much organic produce as possible. Read this article from last year: Top 20 Reasons To Go Vegan. 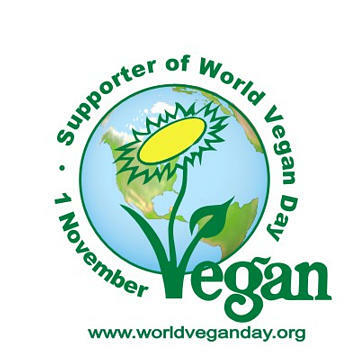 Start by taking The Vegan Pledge & you will receive support from The Vegan Society. To show our support for veganism & encourage folks to give it a go, we are going to post at least a photo each day of our food & interesting snippets for November. Roasted vegetables with chickpeas in a tangy tomato sauce, Sime's mustard mash & steamed kale. We made the sauce similar to our pasta sauce - In a little water, we fried (or simmered on a low heat) lots of sliced onions, chopped garlic, fresh ginger, 8 whole cherry tomatoes & a heaped teaspoon of smoked paprika. After about 20 minutes, we added a tin of chopped tomatoes, a good splash (or 3) of soy sauce, a few drops of vegan Worcestershire sauce, a splash of cider vinegar, a dollop of blackstrap molasses, zest & juice of a small lemon & a sprinkle of black pepper. And the leftovers will be made into a cottage pie for tomorrow!!! Us in Mousehole last week.